As I was rummaging through my hand written recipes this morning, an odd shaped piece of paper brought back memories of Aunt Nance. She was Jim’s Aunt, and a very special person. She would often bake this cake and bring it along to family gatherings. The chopped dates in the recipe are undetectable after baking but they are essential as they add great flavor and moisture to the cake. 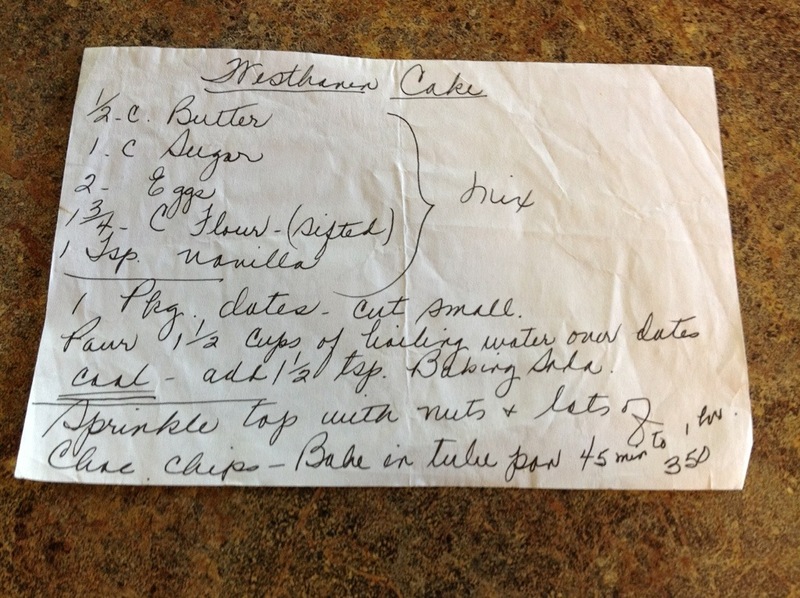 Years ago, I asked Aunt Nance to share the recipe with me and this is the piece of paper she slipped in my hand as I was leaving the gathering. When I finally got around to baking the cake, I noticed that mine wasn’t as dark and chocolatey as hers was. After investigating further, I realized that she had forgotten to include 2 tablespoons of cocoa in the recipe. The cake was still quite delicious so I make it both ways and it’s always a crowd pleaser. Over chopped dates, pour 1 cup boiling water; let cool. Add baking soda and set aside. Cream together butter and sugar. Add eggs, vanilla, flour, cocoa powder, and salt. Pour date mixture into dry ingredients, mix well. Pour into a greased and floured tube pan. Sprinkle chocolate chips and nuts over batter. Bake at 350 degrees for 40-45 minutes. Sprinkle with powdered sugar, and cool cake before serving. This looks great! Old, “hand-me-down” recipes are the best! Yes, it’s a treasured memory of Aunt Nance that I can pass down to my children. Thanks for your comment! 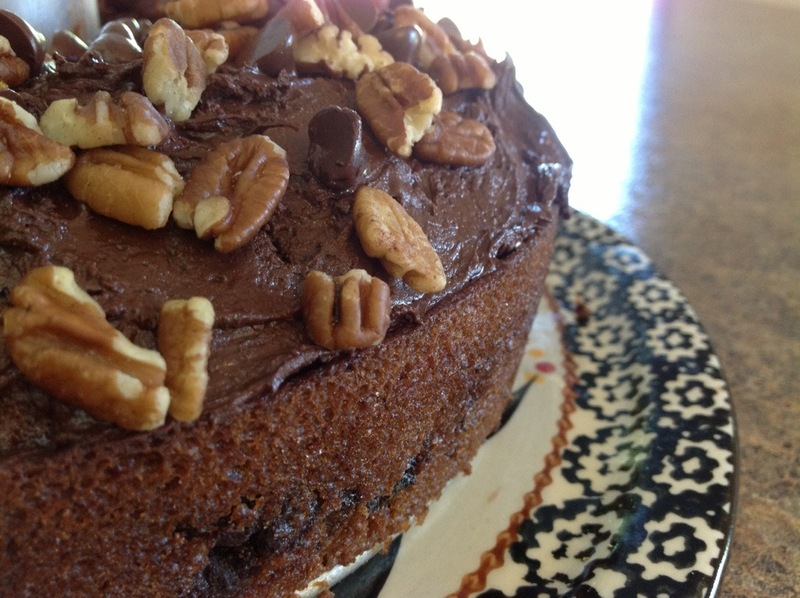 It is a great tasting and super moist cake. It tastes even better when it sits for a day but my family gobbles it up pretty darn quick. Thanks for your comment! Yes, Nancy…you are right. As I mentioned in the post, it brings back memories of a wonderful women that we dearly miss. It’s a keeper! Thanks for your comment and for visiting my blog! Hello! I love the look of your Westhaven Date cake, I have to give it a go (dates are always a staple in our pantry for a quick snack). May I know how much dates to use ? In Malaysia, ours generally come in 500g packs. Ta ! Looks beautiful – recipe sounds very nice! 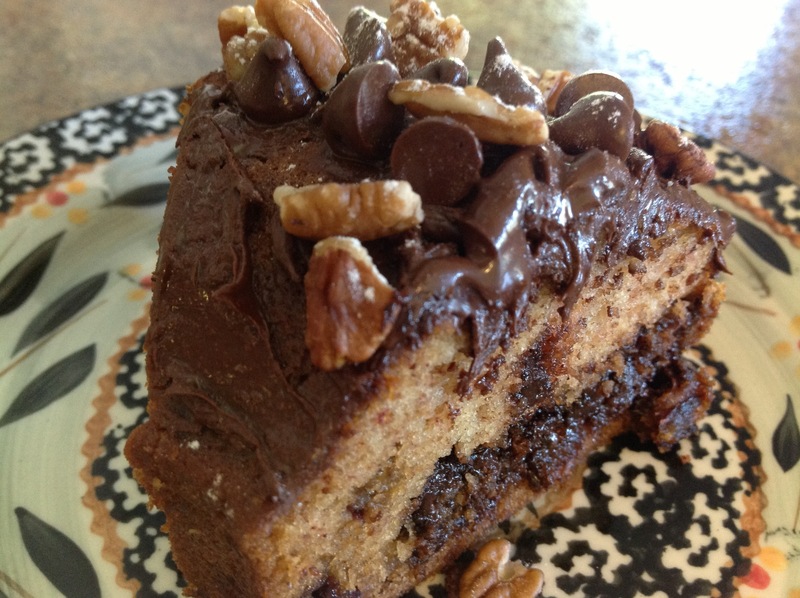 It’s an old recipe, Shanna… But I don’t know why it’s called a Westhaven cake. I’ll have to look it up to find the origin. Thanks for your comment…have a good day! It’s a good cake, Sarah. I don’t know why I don’t make it more often! Thanks for your comment! Scrumptious it is! Thanks for your comment Daniella! hi, thanks for stopping by my blog, I’ve enjoyed browsing the recipes on yours. Can I just ask: how much is a package of dates? I live in the UK, dates come in all sorts of weights and sizes! Oh, I am so sorry that I wasn’t more specific with the package size for the recipe. It is an 8 ounce package. I will make sure to edit my original post. Thank you for the question, I hadn’t noticed my mistake. Let me know if you decide to try the recipe and thanks again for your comment! thanks, hoping to give it a go next week and I’ll let you know – it looks delicious! Best of luck…have a good day!